And here’s what I look like this week. I like this dress, but I have to laugh because there’s a wide band of fabric under the bust line before the belly portion, as if there’s ANY space on my torso under by bust before my belly starts. Hahahaha, NO. I had an anterior placenta with Avery and at about week 15 I was like, “why haven’t I felt her yet?” But after about week 20 I felt her just as much as my others. You look super cute! 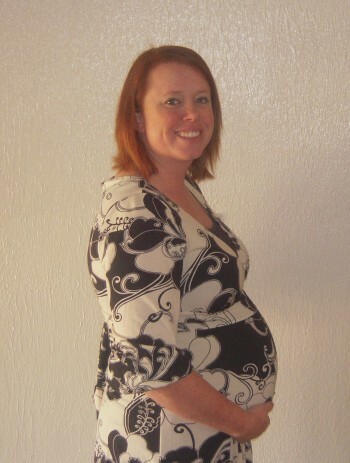 That dress was one of my very favorite pregnancy outfits. I wore it in the triple-pregnant photo with you and Amy! It’s a keeper. AND – I’m 99% positive – it’s not actually a maternity dress! Possibly the reason for the panel. So it’s a keeper AFTER pregnancy as well! You’re right, I just checked and it’s not maternity! So many of our good pregnancy dresses aren’t. I always gain a pretty good chunk of my pregnancy weight before I even get to the first doctor’s appointment so my doctor is always “your weight is right on track!” And I am always “mmmm hmmm, sounds good to me.” I get why they keep track of weight gain and watch it and all, but I think a lot of women fall outside of their “normal” limits. Yes, I always gain in the first trimester. I think mostly because I’m not a puker. So, lots of extra eating and no vomiting.